Okay, so I figured here it is, Spring 2008, and if anyone has clicked on this to see what's happening, they would assume the SSR had been confiscated by the IRS. The SSR still continues to chug along, and has experienced a mini-revival over the course of the past year. Erik Aasland has taken the helm as the National Coordinator as well as Email List administrator, and I am blissfully resigned to obscurity once again. If you are not on the mailing list and would like to be, please contact me and I will send you instructions. But, if you are the owner of any variation of the E3 sedan, know there is a HUGE resource of parts, maintanance tips, suggestions for modifications, improvements, parts compatibility, etc. As of June 1, 1999, after several months of haggling with William over details (which are far from being worked out yet), the always thankless job of Coordinator became my new burden in life. If all goes well, the Senior Six Registry will continue to provide unsurpassed technical assistance to members, newsletters will continue to be published, and the SSR site will be seen and bookmarked by countless numbers of BMW enthusiasts who are beginning to take notice of the E3. As I settle into my new role, which really does involve countless hours behind the computer and on the phone, I have a few ideas for what the SSR should look like when I pass on the job of Coordinator to either someone new, or possibly back to William, as per our agreement (no wiggling out of that, Willie!). First, because the members are what make this club what it is, I would like to see the SSR double in size. We currently have around 215 members nationwide. There are many, many more E3s out there, and if we stick to our Mission, a whole new generation of high school kids will be making modifications we can only imagine. I have no doubt that someone will eventually get a BMW V8 to fit in an E3, only to be outdone by a BMW V12. 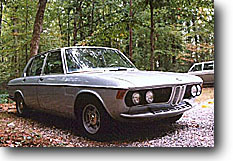 Second, I believe that the SSR will benefit from a stronger ties with the BMWCCA. Once the staunchest naysayer among us, I have recently sent my dues and joined the club. I would encourage other members to do the same. Show up at the local chapter events and gain the attention of onlookers who are bewildered and speechless at the sight of your car. Ask about any other E3s they might know of, running or otherwise; if you see one, drop off a membership flyer as you are getting the VIN number. I believe that by working with the local chapters we can accomplish our Mission more thoroughly, and maybe get some photos of our E3s in official publications along the way. Third, and lastly, I encourage all members to attend the East and West Fests, which have been growing more successful each year. Want a challenge? Try attending both! I've done it, and hope to do it again. And if there is no Fest close to you, start one of your own. William has mentioned the possibility of an Arizona Fest, and I'd like to see a both a MidWest Fest and a Northeast Fest. The point is to get out there and meet with other members, have fun, kick each others' cars, and plan road trips and other events. The Fests have breathed new life into the SSR, so get there if you haven't and see what you've been missing. That's it for now. As your new Coordinator, I'd like to thank you for both your support and your membership. This is your club. If you have a suggestion, feel free to contact me any time. In the Early Eighties, Paul Hoecke (current BMW CCA Tarheel Chapter VP) and Mark Borkowski (presently a Mercedes-Benz defector, from what I understand) decided that it was a crime to have these great cars and no registry. Everybody else had a Registry - the 2002, the M1, the 6 Series. Why not the E3? So they threw it together. Build it, and they will come.The beginning culminated in the publication of their first newsletter in August of 1982. The opening comments from the editors began with an apology for the newsletter being late (four months) and a plea for material for the newsletter, then called Wundercar!. Membership flourished in a market where used Bavarias were plentiful and relatively cheap. The success of the BMW Car Club of America provided ample membership to draw from, and similarly ample resources for parts, technical advice, and a sense of fellowship. Soon, however, the thankless job of Coordinator grew burdensome and the task was shift to Gary Apps of Kalamazoo, Michigan. The quality and the size of the Registry soon took off under the control of Mr. Apps. He ran it successfully for 3 or 4 years, managing to print a total of 18 issues before he consequently disappeared off the face of the earth. His publication schedule was ofttimes late, and eventually he gave up all together. This was about 1989 or so. Fast forward to 1996. I inherited a 1972 Bavaria as part of my wife's dowry (I'm not kidding!). I knew nothing about the car, but I am used to having the world at my fingertips via the World Wide Web. I want to do a search for this car. I entered "Bavaria". I was sent to the Bavaria Holland Beer Company in the Netherlands. Nothing on BMW Bavarias. Nothing. I find this astonishing. Aren't old BMWs collector's items? Isn't every teenage girl driving a 2002tii? Aren't 3.0 CSLs going for the cost of my house? Isn't a Bavaria an old BMW? Through a bit of inquiring on the BMW Digest (that's a whole other can of worms), I find out that the E3 is somehow relegated to the land of the misfit toys of the BMW community. I am taken aback. I am appalled. Having driven this car for several months before I started this inquisition, I have found it responsive, fast, and comfortable, exhibiting all of the traits of most European cars, regardless of age. I have raced new 5 series on the expressway and killed them. I have ridden in 2002s that I thought for sure were fabricated by primates at the Munich Zoo. How can one be popular and the other be exiled into the automotive realm of the AMC Pacer? So, in an effort to answer these unanswerable questions, I began conspiring with Tom Van Gunten of Irving, Texas. I eventually announced (unceremoniously, I might add) that I intended to resurrect the Senior Six Registry. I don't recall what his response was, but I remember his attitude being the same as one who has long awaited a revolution, and, having a charismatic (though ignorant) dupe, mysteriously produces the implements of war: names, rosters, phone numbers, e-mail addresses, articles, etc., and a whole lot of encouragement. And so, after mailing 275 letters to the original members, after attempting to call / write / e-mail / fax / carrier pigeon a note to Gary Apps for 5 months, after phone calls, xeroxes, writing, and re-writing this humble epistle, we cranked out the first issue, which signified the official resurrection of the Senior Six Registry. I consider myself the Coordinator, as I did all this nonsense myself. I could not, however, have done anything without the encouragement and advice of Tom, as well as Steve Good (of Ephrata, PA), who is serving the Registry as it's reluctant recruiter/hatchet man (though he probably won't know it until he reads this).